For Howard's essay describing the Hyborian Age, see The Hyborian Age. Another version of the map, drawn by David Kyle for the 1950 Gnome Press edition of Conan the Conqueror. 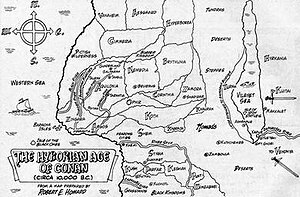 The word "Hyborian" is derived from the legendary northern land of the ancient Greeks, Hyperborea, and is rendered as such in the earliest draft of Howard's essay "The Hyborian Age." Howard described the Hyborian Age taking place sometime after the sinking of Atlantis and before the beginning of recorded ancient history. Most later editors and adaptors such as L. Sprague de Camp and Roy Thomas placed the Hyborian Age around 10,000 BC. More recently, Dale Rippke proposed that the Hyborian Age should be placed further in the past, around 32,500 BC, prior to the beginning of the last glacial period. Rippke's date, however, has since been disputed by Jeffrey Shanks who argues for the more traditional placement at the end of the ice age. Howard had an intense love for history and historical dramas; however, at the same time, he recognized the difficulties and the time-consuming research needed in maintaining historical accuracy. By conceiving a timeless setting – a vanished age – and by carefully choosing names that resembled our history, Howard avoided the problem of historical anachronisms and the need for lengthy exposition. Howard explained the origins and history of the Hyborian civilization in his essay "The Hyborian Age". The essay begins with the civilizations of the Thurian Age, Lemuria, and Atlantis (mentioned in his series about Kull) being destroyed by a cataclysm. According to the essay, after this cataclysm, a tribe of primitive humans were at a technological level hardly above the Neanderthal. They fled to the northern areas of what was left of the Thurian continent to escape destruction. They discovered the region to be safe, but covered with snow and already inhabited by a race of vicious apes. The apes were large with white fur and apparently native to their land. The Stone Age invaders engaged in a territorial war with them and eventually managed to drive them off, past the Arctic Circle. Believing their enemies were destined to perish and no longer interested in them, the recently arrived group adapted to their new, harsh environment and its population increased. One thousand five hundred years later, the descendants of this initial group were called "Hyborians". They were named after their highest ranking god deity, Bori. The essay mentions that Bori had actually been a great tribal chief of their past who had undergone deification. Their oral tradition remembered him as their leader during their initial migration to the north, though the antiquity of this man had been exaggerated. By this point, the various related but independent Hyborian tribes had spread throughout the northern regions of their area of the world. Some of them were already migrating south at a "leisurely" pace in search of new areas in which to settle. The Hyborians had yet to encounter other cultural groups, but engaged in wars against each other. Howard describes them as a powerful and warlike race with the average individual being tall, tawny-haired, and gray-eyed. Culturally, they were accomplished artists and poets. Most of the tribes still relied on hunting for their nourishment. Their southern offshoots, however, had been practicing animal husbandry on cattle for centuries. The only exception to their long isolation from other cultural groups came due to the actions of a lone adventurer, unnamed in the essay. He had traveled past the Arctic Circle and returned with news that their old adversaries, the apes, were never annihilated. They had instead evolved into apemen and, according to his description, were by then numerous. He believed they were quickly evolving to human status and would pose a threat to the Hyborians in the future. He attempted to recruit a significant military force to campaign against them, but most Hyborians were not convinced by his tales; only a small group of foolhardy youths followed his campaign. None of them returned. With the population of the Hyborian tribes continuing to increase, the need for new lands also increased. The Hyborians expanded outside their familiar territories, beginning a new age of wanderings and conquests. For 500 years, the Hyborians spread towards the south and the west of their nameless continent. They encountered other tribal groups for the first time in millennia. They conquered many smaller clans of various origins. The survivors of the defeated clans merged with their conquerors, passing on their racial traits to new generations of Hyborians. The mixed-blooded Hyborian tribes were in turn forced to defend their new territories from pure-blooded Hyborian tribes which followed the same paths of migration. Often, the new invaders would wipe away the defenders before absorbing them, resulting in a tangled web of Hyborian tribes and nations with varying ancestral elements within their bloodlines. The first organized Hyborian kingdom to emerge was Hyperborea. The tribe that established it entered their Neolithic age by learning to erect buildings in stone, largely for fortification. These nomads lived in tents made out of the hides of horses, but soon abandoned them in favor of their crude but durable stone houses. They permanently settled in fortified settlements and developed cyclopean masonry to further fortify their defensive walls. The Hyperboreans were by then the most advanced of the Hyborian tribes and set out to expand their kingdom by attacking their backwards neighbors. Tribes who defended their territories lost them and were forced to migrate elsewhere. Others fled the path of Hyperborean expansion before ever engaging them in war. Meanwhile, the apemen of the Arctic Circle emerged as a new race of light-haired and tall humans. They started their own migration to the south, displacing the northernmost of the Hyborian tribes. For the next thousand years, the warlike Hyborian nations advanced to become the rulers of the western areas of the nameless continent. They encountered the Picts and forced them to limit themselves to the western wastelands, which would come to be known as the "Pictish Wilderness". Following the example of their Hyperborean cousins, other Hyborians started to settle down and create their own kingdoms. The southernmost of the early kingdoms was Koth, which was established north of the lands of Shem and soon started extending its cultural influence over the southern shepherds. Just south of the Pictish Wilderness was the fertile valley known as "Zing". The wandering Hyborian tribe which conquered them found other people already settled there. They included a nameless farming nation related to the people of the Shem and a warlike Pictish tribe who had previously conquered them. They established the kingdom of Zingara and absorbed the defeated elements into their tribe. Hyborians, Picts, and the unnamed kin of the Shemites would merge into a nation calling themselves Zingarans. On the other hand, at the north of the continent, the fair-haired invaders from the Arctic Circle had grown in numbers and power. They continued their expansion south while in turn displacing defeated Hyborians to the south. Even Hyperborea was conquered by one of these barbarian tribes. But the conquerors here decided to maintain the kingdom with its old name, merged with the defeated Hyperboreans and adopted elements of Hyborian culture. The continuing wars and migrations would keep the state of the other areas of the continent for another five hundred years. A larger map of Earth in Robert E. Howard's Hyborian Age. The Hyborian Age was devised by author Robert E. Howard as the post-Atlantean setting of his Conan the Cimmerian stories, designed to fit in with Howard's previous and lesser known tales of Kull, which were set in the Thurian Age at the time of Atlantis. The name "Hyborian" is a contraction of the Greek concept of the land of "Hyperborea", literally "Beyond the North Wind". This was a mythical place far to the north that was not cold and where things did not age. Howard's Hyborian epoch, described in his essay The Hyborian Age, is a mythical time before any civilization known to anthropologists. Its setting is prehistoric Europe and North Africa (with occasional references to Asia and other continents). On a map Howard drew conceptualizing the Hyborian Age, his vision of the Mediterranean Sea is dry. The Nile, which he renamed the River Styx, takes a westward turn at right angles just beyond the Nile Delta, plowing through the mountains so as to be able to reach the Straits of Gibraltar. Although his Black Sea is also dry, his Caspian Sea, which he renames the Vilayet Sea, extends northward to reach the Arctic Ocean, so as to provide a barrier to encapsulate the settings of his stories. Not only are his Baltic Sea and English Channel dry, but most of the North Sea and a vast region to the west, easily including Ireland, are, too. Meanwhile, the west coast of Africa on his map lies beneath the sea. In his fantasy setting of the Hyborian Age, Howard created imaginary kingdoms to which he gave names from a variety of mythological and historical sources. Khitai is his version of China, lying far to the east, Corinthia is his name for a Hellenistic civilization, a name derived from the city of Corinth and reminiscent of the imperial fief of Carinthia in the Middle Ages. Howard imagines the Hyborian Picts to occupy a large area to the northwest. The probable intended analogues are listed below; notice that the analogues are sometimes very generalized, and are portrayed by ahistorical stereotypes. Most of these correspondences are drawn from "Hyborian Names", an appendix featured in Conan the Swordsman by L. Sprague de Camp and Lin Carter. Acheron A fallen kingdom corresponding to the Roman Empire. Its territory covered Aquilonia, Nemedia, and Argos. In Greek mythology, Acheron was one of the four rivers of Hades (cf. "Stygia"). Afghulistan Afghanistan. Afghulistan (sometimes "Ghulistan") is the common name for the habitat of different tribes in the Himelian Mountains. The name itself is a mixture of the historical names of Gulistan and Afghanistan. Amazon Mentioned in Robert E. Howard's Hyborian Age essay, the kingdom of the Amazons refers to various legends of Greek Amazons, or more specifically to the Dahomey Amazons. In classical legend, Amazonia is a nation of warrior women in Asia Minor and North Africa. The legend may be based upon the Sarmatians, a nomadic Iranian tribe of the Kuban, whose women were required to slay an enemy before they could marry. Aquilonia A cross between the Roman Empire and Carolingian Empire. The name is borrowed from Aquilonia, a city of Southern Italy, between modern Venosa and Benevento; it is also an ancient name of Quimper and resembles that of Aquitaine, a French region ruled by England for a long portion of the Middle Ages. The name is derived from Latin aquilo(n–), "north wind". Argos Various seafaring traders of the Mediterranean. The name comes from the Argo, ship of the Argonauts; or perhaps from the city of Argos, Peloponnesos, reputedly the oldest city in Greece, situated at the head of the Gulf of Argolis near modern Nafplion. Also, hints of Italy in regards to the indigenous population's appearance, names and culture. Howard labels the populace of his Argos as "Argosseans", whereas the folk of the historical Argos are known as "Argives". In Hyborian Age cartography, Argos takes on the shape of a "shoe" in its border boundaries as compared to Italy appearing as a "boot". The coastal city of Messantia/Massantia derives its name from Massalia, the name given to Marseilles by its Greek founders. (Aesgaard in comics) Dark Age Scandinavia. Ásgard is the home of the Æsir in Norse mythology. Howard states that the Baltic Sea would, post-cataclysm, divide his fictional Asgard into the modern Norway, Sweden, and Denmark according to The Hyborian Age essay. Barachan Islands The Caribbean Islands. Possibly after the Islas Borrachas ("Drunken Isles"). The pirate town of Tortage takes its name from Tortuga. Border Kingdoms Geographically located over the modern German Baltic Sea coast. A lawless region full of savages. Conan once traveled through the Border Kingdoms on his way to Nemedia. He befriended Mar the Piper and the King of the Border Kingdoms. He helped save the kingdoms before returning to his quest in reaching Nemedia. Bossonian Marches Wales, with an overlay of colonial North America. Possibly from Bossiney, a former parliamentary borough in Cornwall, South West England, which included Tintagel Castle, connected with the Matter of Britain. Brythunia The continental homelands of the Angles and Saxons who invaded Great Britain, which is the origin of the name. Semantically, the name Brythunia is from the Welsh Brython, "Briton", derived from the same root as the Latin Brito, Britannia, although Howard stated that the name was kept by the Æsir and Nemedians who settled there. The land is depicted geographically over modern Poland, Lithuania, and Latvia. Cimmeria Howard states in The Hyborian Age that "the Gaels, ancestors of the Irish and Highland Scots, descended from pure-blooded Cimmerian clans." He correlates Cimmeria to the Cymric people, Cimbri, Gimirrai, Scythians, Cimmerians, and the Crimea. Geographically located over modern Ireland, Scotland, and England (since during the cataclysm which would mark the end of the said Hyborian Age), Cimmeria is said (according to the essay "The Hyborian Age" by Robert E. Howard) to partially sink, surrounded by what would be the North Sea, with its mountains dislocating into the British Isles. The name is derived from the Greek legends of a northern people who lived in perpetual mist and darkness near the Land of the Dead. Conajohara (Aquilonia) The name may have been based on Canajoharie. Corinthia Ancient Greece. From Corinth (Korinthos), a rich city in Classical Greece. Possibly suggested to Howard by the Epistles to the Corinthians, or by the region of Carinthia. Darfar Howard derived this name from the region of Darfur, Sudan, in North-Central Africa. Darfur is an Arabic language name meaning "abode (dar) of the Fur", the dominant people of the area. In changing the name to Darfar, Howard unwittingly changed the Arabic meaning to "the abode of mice". The original Darfur is now the westernmost part of the Republic of the Sudan. Gunderland Possibly from Gunderland of Hesbaye, a count in the Merovingian court, or from Gelderland a province in The Netherlands or from Gunther (Gundicar), King of Burgundy or Gunderic, King of the Vandals. Hyperborea Finland, Russia, and the Baltic countries (Hyperborea). Is a land in the "outermost north" according to Greek historian Herodotus. 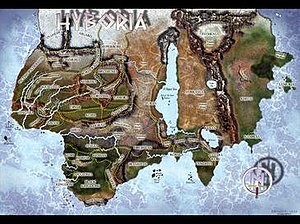 Howard's Hyperborea is described as the first Hyborian kingdom, "which had its beginning in a crude fortress of boulders heaped to repel tribal attack". Hyrkania (Eurasian Steppe), Hyrcania, in classical geography, was a region southeast of the Caspian Sea or Hyrcanian Sea corresponding to the Iranian provinces of Golestan, Mazandaran and Gilan. The name is Greek for the Old Persian Varkana, one of the Achaemenid Empire satrapies, and survives in the name of the river Gorgan. The original meaning may have been "wolf land". In Iranian legend, Hyrcania is remarkable for its wizards, demons, wolves, spirits, witches, and vampires. Iranistan An eastern land corresponding to modern Iran. Historically, the name of the country is derived from the Iran + the Persian istan, estan, "country". Kambuja/Kambulja The original name of Cambodia, also known as Kampuchea. Keshan The name comes from the "Kesh", the Egyptian name for Nubia. Khauran The name perhaps derives from the Hauran region of Syria. Khitai China. The name is derived from the Khitan Empire (Chinese 遼朝 Liáo cháo or the Liao Dynasty) and the people who ruled northern and northeastern China. The name is derived from the Khitan language for 'The Khitan Empire', Mos diau-d kitai huldʒi gur; in modern Mandarin Chinese, 契丹國 or Qìdān guó. 'Khita' is also the origin of the Russian name for China, "Kitai" (Китай), which is related to the English word "Cathay" and Marco Polo's Cathay (/kæˈθeɪ/). 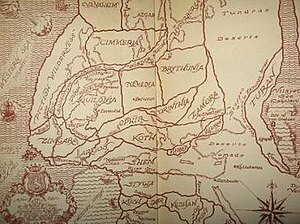 In the Hyborian age, Khitai is an ancient empire which is always at war with Kambuja to the south. In ancient times Khitai was subjugated by an empire of conquerors from a mysterious continent in the eastern ocean(Mu? ).After the cataclysm this empire made slaves of the lemurians that succeded to flee the destruction. With time these, and perhaps the gentile khitanians, were able to rise and topple this emprire. Perhaps Vendhya had something to do with this? The remnants of this white-skinned master race fled westwards, conquering the land of the serpentmen and founding Stygia. The people of Khitai are yellow-skinned and of medium height. Khitai is ruled by a God-Emperor whose decisions are greatly influenced by the Scarlet Circle, a clan of some of the most powerful mage lords in all of Hyboria. Khitan laws flow from the overlord of a city-state. The culture of Khitai is similar to that of ancient China. The most prominent feature of Khitai is its Great Wall (similar to the Great Wall of China), which protects it from foreign invasions from the north. The cities of Khitai are Ruo-Chen, Shu-Chen, Shaulum, and the capital, Paikang, which contains the Jade Citadel, from where the God-Emperor rules over all of Khitai. Khoraja Constantinople and the Etruscans and possibly the associated Principality of Antioch, County of Edessa, and County of Tripoli, collectively known as Outremer. The name itself was inspired by the references of Sax Rohmer to the fictional city of Khorassa in the novel The Mask of Fu Manchu. Kosala From the ancient Indo-Aryan kingdom of Kosala, corresponding roughly in area with the region of Oudh. Kozaki Semi-barbaric steppe-dwelling raiders analogous to the Cossacks. Koth From the ancient Hittites (the name Koth may come from the fact that the Hittites are called in the Bible the children of Heth, and the Egyptians called their land Kheta); The Kothian capital of Khorshemish corresponds to Carchemish, capital of a Neo-Hittite kingdom. Perhaps from The Sign of Koth in The Dream-Quest of Unknown Kadath by H. P. Lovecraft. There is a town of Koth in Gujarat, India, but the connection is doubtful. Howard also used the same name in his interplanetary novel Almuric. Kusan Probably from the Kushan Empire. Kush From the kingdom of Kush, Nubia, North Africa. Meru Tibet. In Hindu mythology, Meru is the sacred mountain upon which the gods dwell. NOTE: Meru is not an original Hyborian Age country and was created by L. Sprague de Camp and Lin Carter for "The City of Skulls". Nemedia A cross between Rome and Byzantium. Nemedia is the rival of Aquilonia (which corresponds to the Carolingians), and depended on Aesir mercenaries for their defence (as the Byzantine Empire hired Vikings as the Varangian Guard). The name comes from Nemed, leader of colonists from Scythia to Ireland in Irish mythology; perhaps the name is also meant to allude to Nemea, home to the Nemean Lion of Greek mythology. The name may also be suggestive of various names for Germany in Slavic languages, e.g. Czech Německo. Ophir Ancient Ophir, a gold-mining region in the Old Testament, possibly on the shores of the Red Sea or the Arabian Sea (e.g. western Arabia), though clearly Howard saw it as situated somewhere in Italy. Pelishtim Philistines (P'lishtim in Hebrew). The Pelishti city of Asgalun derives its name from Ashkelon. The Pelisti god Pteor or Baal-Pteor derives his name from the Moabite Baal-Peor. Pictish Wilderness Pre-Columbian America, with an overlay of North America during the European colonization of the Americas, possibly even colonial-era New York. Howard bestows names from Iroquoian languages on many of his Hyborian-Age Picts (but not the quasi-historical Picts featuring Bran Mak Morn). Note that the name "Pict" comes from the Latin language term for "painted one", which could be applicable to a number of the Indigenous peoples of the Americas. The historical termed Picts were a confederation of Celtic tribes in central and northern Scotland which bordered Roman Britain. Poitain A combination of Poitou and Aquitaine, two regions in southwestern France. From the 10th to the mid-12th century, the counts of Poitou were also the dukes of Aquitaine. Punt The Land of Punt on the Horn of Africa. A place with which the ancient Egyptians traded, probably Somaliland. Shem Mesopotamia, Syria, Palestine, and Arabia. In the Bible, Shem is Noah's eldest son, the ancestor of the Hebrews, Arabs and Assyrians; hence, the modern "Semite" and Semitic languages (via Greek Sem), used properly to designate the family of languages spoken by these peoples. Stygia Egypt. The name comes from the Styx, a river of the Greek underworld in Greek mythology. In earlier times the territory of Stygia included Shem, Ophir, Corinthia, and part of Koth. Stygia is ruled by a theocracy of sorcerer-kings. The people are dark-skinned. Most of the common people are descendants of the various races across the world. They worship the serpent god Set. Stygia's terrain is a mix of mountains, deserts, and marshes. The River Styx flows through Stygia into the sea. Hellenistic Egypt had a political religion of state, the Cult of Serapis, a blending together of Hades (Styx) and Osiris, mostly the former. Perhaps this has inspired the Serpent Cult of Howard's Stygia. The commoners of Stygia may still, in spirit, be the original human slaves or slave races of the serpent men who ruled this kingdom centuries befoe. The white skinned elite may still worship "The great dark nameless one"(Skelos?). Turan Persian name for Turkestan. A Turkish land, possibly referring to the Gokturk Empire, the Timurid Empire, or the Seljuk Empire. The name derives from Turan, the areas of Eurasia occupied by speakers of Ural–Altaic languages. The names of the various Turanian cities (e.g. Aghrapur, Sultanapur, Shahpur) are often in Persian language. King Yezdigerd is named after Yazdegerd III, ruler of the Sassanid Empire. The name of King Yildiz means star in the Turkish language. The city of Khawarizm takes its name from Khwarezm, and Khorusun from Khorasan. Uttara Kuru From the medieval Uttara Kuru Kingdom in the north and central reaches of Pakistan. NOTE: Uttara Kuru is not an original Hyborian Age country. Vanaheim Dark Age Scandinavia. Vanaheim is the home of the Vanir in Norse mythologyThe red haired vanir will finally oust the evil aristocracy of Stygia and found pharaonic Egypt. They are red haired because old egyptian legends say that Egypt was founded by "red haired" strangers from outside. Vendhya India (the Vindhya Range is a range of hills in central India). The name means "rent" or "ragged", i.e. having many passes. This very ancient kingdom worships the god Asura, indian version of persian "Ahura", as in Ahura Mazda, among other things father of the god Mithra. This cult has spread westwards and is present, albeit often persecuted, in the hyborian lands. In Aquilonia it finds a protector in king Conan. Yamatai Japan, probably inspired by the historical name of Yamatai. The land of Yamatai is described as "a cluster of islands east of Khitai", ruled by the "Witch Queen of Yamatai" in the omonymous The Savage Sword of Conan story, herself possibly inspired by the historical shaman-queen Himiko. NOTE: Yamatai is not an original Hyborian Age country. Wadai (tribe) The Wadai Empire in present-day Chad. Wazuli (tribe) The Waziri tribe in northwest Pakistan. Zamora The Romani people. The name comes from the city of Zamora, Zamora province, Castile-León, Spain, alluding to the Gitanos of Spain (see Zingara for discussion); or possibly it is based on the word "Roma". There may also be some reference to southern Italy, as Zamorans dance the tarantella in honor of their Spider-God (variously known as Omm and Zath). Also hints of Ancient Israel and Palestine. Zembabwei The Munhumutapa Empire. The name comes from Great Zimbabwe, a ruined fortified town in Rhodesia, first built around the 11th century and used as the capital of the Munhumutapa Empire. Oddly, this is the same root as the modern name for the Republic of Zimbabwe. Zingara Spain/Portugal. Iberian Peninsula as a whole. Zingara is also Italian for "Gypsy woman"; this may mean that Howard mixed up the source names of Zingara and Zamora, with Zingara originally meant to apply to the Roma kingdom, and Zamora to the Spanish kingdom. Zuagir (tribe) The name is perhaps derived from a combination of Tuareg and Uyghur. Amir Jehun Pass Takes its name from a combination of the Amu Darya river and the Gihon river (Jayhoun in Arabic), which has been identified by some with the Amu Darya. Perhaps corresponds to the Broghol Pass, which is near the headwaters of the Amu Darya in Wakhan. The Himelian Mountains Take their name from the Himalayas but correspond more closely to the Hindu Kush or Karakoram ranges. The Karpash Mountains The Carpathian Mountains. The Poitanian Mountains The Pyrenees, which are just south of the Aquitaine region of France. The River Styx The River Styx runs northward through Stygia, following the course of the historical Nile river. Then it turns and runs westward through Shem, following the historical Mediterranean Sea, finally emptying into the western ocean. Styx, in classical mythology, is the River of the Dead and this symbolism is used in The Hour of the Dragon. The River Alimane Alamana river, (present Spercheios) in Greece. It may also be a reference to the Alemanni. Vilayet Sea Geographically, the Caspian Sea. The name comes from vilayet, the term for administrative regions in the Ottoman Empire. Zhaibar Pass The Khyber Pass which has been the traditional borderline between Afghanistan and Pakistan. Zaporoska River The Dnieper river and/or the Don and/or the Volga. The river's name was probably influenced by Zaporizhian Sich, a settlement of the Ukrainian Cossacks in Zaporizhzhia (region). It was situated on the Dnieper river, below the Dnieper rapids (porohy, poroz.a), hence the name, translated as "territory beyond the rapids". ^ "The Savage Sword of Conan #194 - The Witch Queen of Yamatai (Issue)". Comic Vine. Retrieved 4 April 2018.